We started with a short drama drama exercise to welcome each other and to get a first idea about our expectations for the afternoon. 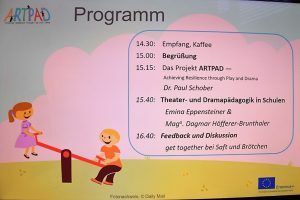 After this warm-up session, Paul Schober started to introduce the main ideas of the ARTPAD Project, the concept of resilience and the six ARTPAD principles, which are the base for supporting resilience. 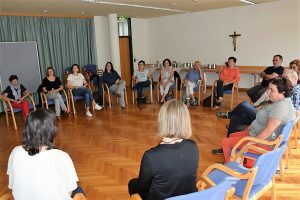 Empowerment, Environment, Methodology of Drama and Play, attitude of the adults, the individual within the group and alignment are essential in this context. 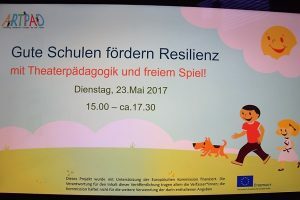 Emina Eppensteiner and Dagmar Höfferer-Brunthaler reported on their work in schools. Both are experts in educational drama and they gave a clear insight into the practical dimensions of educational drama. Although the research findings on resilience are well known, the concrete implementation in the educational institutions is only at the beginning. To enable children and adolescents to resiliency, to cope with crises in such a way that learning chances arise, is becoming increasingly important. It is not only meant to deliberately accept a failure in certain areas, but also to provide learning opportunities and to train the resilience of one’s own personality. The methods of theatre and drama education are certainly well suited for this. The recognition of uncertain play situations, the risk of a common approach to themes and content, to allow failure to learn from it – all these elements of drama / theatre pedagogy are promoting resilience-, and they are usually also joyful and very motivating. The next input came from Paul Schober again;he presented the Best Practice Guide more detailed and also gave a preview of the training course. The training course will be piloted in Poland March next year and after that adapted and transferred to Austria. All participants were highly interested into training and we will keep them informed.